If you have an identity, someone can steal it. It is a simple concept that presents many complicated problems for e-commerce sites. The tools and tactics employed by scam artists are virtually limitless, while merchants only have access to a few insufficient safeguards. By utilizing our vast experience in both public and private database access we created a comprehensive ID Verification Test that is surprisingly simple for genuine customers to pass and nearly impossible for cons. At SafeID.org, we are dedicated to providing our customers the very best in ID verification solutions. While our service excels at preventing online fraud, it also lends itself to other applications such as on demand lead verification. With our extensive database access we can confirm both the accuracy as well as the quality of your leads. SafeID.org is owned and operated by Accucom Corporation, a national leader in the public records industry, taking pride in catering to each customer's individual needs when it comes to accessing information from public and private sources. Accucom offers dozens of different online products ranging from basic people searches to in depth criminal records checks and ID verification. 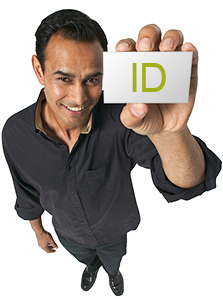 The ID Verification Service provided by SafeID uses Patent Pending Technology not available anywhere else.